If I do not like something about The New York Times, it is its travel section. 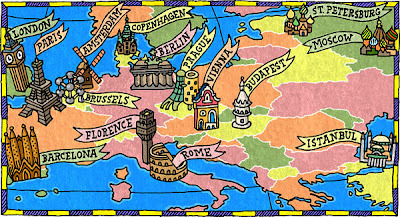 An article (or actually a series of articles) entitled Affordable Europe: city guides is a prime example of how useless it is. The fancy picture and a sentence: The euro remains strong, but you don’t have to max out your credit card to indulge might lure many people to read this article. But what you get if you do so is more than disappointing. For example, the paragraph that is supposed to provide you with the recommendations of places to stay is entitled Where to Stay for Under 125 Euros and in fact it gives you only recommendations of hotels with prices around 150$/person/night! I would like to know which percentage of readers of NYT considers as "affordable" spending only on hotels during a two-week holidays in Europe 8.500$ (calculation based on the assumption that the average family size is 4).